Posted by Summerspeaker in Anti-imperialism, Decolonization, Transhumanism. 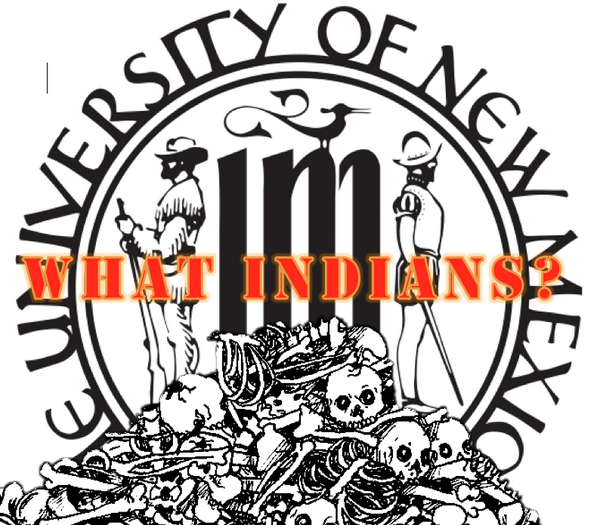 The University of New Mexico – where I study – isn’t just a colonial institution, it’s blatantly and unapologetically so. The official seal celebrates two iconic Indian killers: the Anglo frontiersman and Spanish conquistador. This is what living inside a settler-colonial society looks like. Everything that comes out of the United States – specifically the technoscience we transhumanist so adore – relies on stolen land and the structural genocide of Native peoples. Colonialism isn’t incidental or unrelated to the transhumanist project, but foundational to it. Transhumanism needs to work toward decolonization to have any hope of being a positive force in the world.